Build a lead scoring model to identify potential leads. Track your lead behavior, assign positive and negative scores, and pinpoint the right leads for your sales team to follow-up. 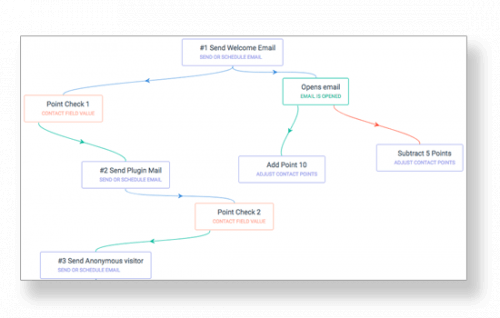 Start assigning scores to each lead activity and map their progress within the marketing funnel. 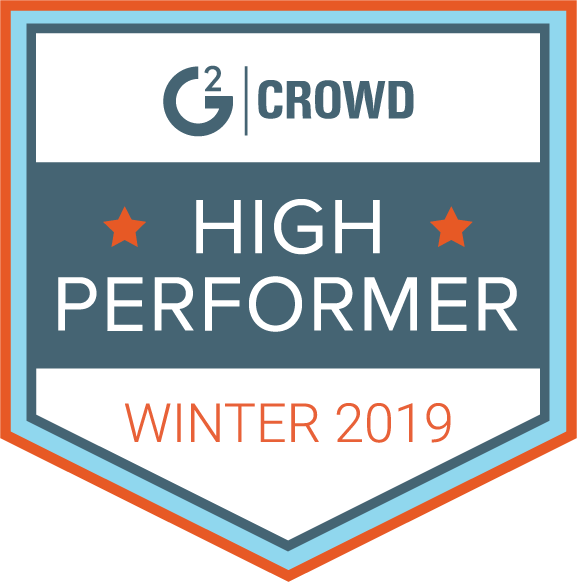 Assign implicit or explicit lead scores to map your leads’ progress effectively and design tailored marketing campaigns. Design a lead scoring model that helps you to engage with your potential buyers and trigger activities that will push your leads towards conversion. Assign scores for each activity of your leads, add negative scores when leads are dormant or move backward in your marketing-sales funnel. Use different types of pointers for each action, trigger, behavior, and user profiles. Implicit lead scoring is based on lead behavior and inferred information. It can be anything from attending a webinar to downloading an asset or visiting certain web pages. Assign negative scores for any lead that exhibits signs of moving backward in the marketing funnel. This lead scoring helps you assign scores based on information that you have acquired directly from the lead like through a form fill up. This type of data includes details like job profile, name, email, company details, etc. Target right audience with explicit lead scoring. Use lead tracking code (aritic pixel code) on your website to track your leads. Each action of the lead earns them certain points. Based on the total lead scores, plan out your next move. 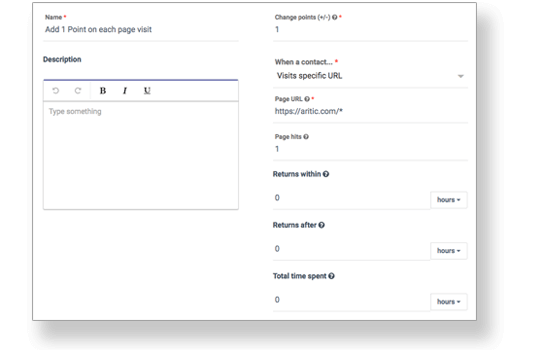 Assign negative scores for actions that indicate that your visitors or leads have gone a step back in the funnel or is unresponsive for a considerable time. Directly make changes in the points from the campaign list window in few clicks. Adjust contact points based on campaign engagement and performance in few seconds. Pass on only those leads that are ready to hit the ‘buy’ button to your sales team. Increase your conversion rates with the lead scoring feature. 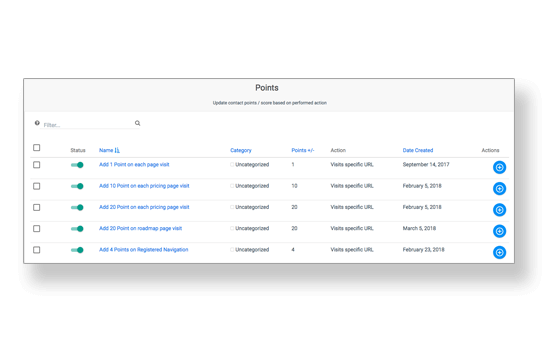 Create more point actions to determine proper scoring for each activity of your visitors, leads, and customers. Map their behavior and accordingly create actions to keep a track of their lead score. Create actionable triggers for your visitors and potential buyers. Determine what will trigger a point addition or negative scoring based on specific and customized triggers.